The GABA receptors are a class of receptors that respond to the neurotransmitter gamma-aminobutyric acid (GABA), the chief inhibitory compound in the mature vertebrate central nervous system. GABA receptors influence cognition by coordinating with glutamatergic processes. There are two classes of GABA receptors: GABAA and GABAB. GABAA receptors are ligand-gated ion channels (also known as ionotropic receptors); whereas GABAB receptors are G protein-coupled receptors, also called metabotropic receptors. It has long been recognized that the fast response of neurons to GABA that is blocked by bicuculline and picrotoxin is due to direct activation of an anion channel. This channel was subsequently termed the GABAA receptor. Fast-responding GABA receptors are members of a family of Cys-loop ligand-gated ion channels. Members of this superfamily, which includes nicotinic acetylcholine receptors, GABAA receptors, glycine and 5-HT3 receptors, possess a characteristic loop formed by a disulfide bond between two cysteine residues. In ionotropic GABAA receptors, binding of GABA molecules to their binding sites in the extracellular part of the receptor triggers opening of a chloride ion-selective pore. The increased chloride conductance drives the membrane potential towards the reversal potential of the Cl¯ ion which is about –65 mV in neurons, inhibiting the firing of new action potentials. This mechanism is responsible for the sedative effects of GABAA allosteric agonists. In addition, activation of GABA receptors lead to the so-called [shunting inhibition], which reduces the excitability of the cell independent of the changes in membrane potential. There have been numerous reports of excitatory GABAA receptors. According to the excitatory GABA theory, this phenomenon is due to increased intracellular concentration of Cl¯ ions either during development of the nervous system or in certain cell populations. After this period of development, a chloride pump is upregulated and inserted into the cell membrane, pumping Cl− ions into the extracellular space of the tissue. Further openings via GABA binding to the receptor then produce inhibitory responses. Over-excitation of this receptor induces receptor remodeling and the eventual invagination of the GABA receptor. As a result, further GABA binding becomes inhibited and inhibitory postsynaptic potentials are no longer relevant. However, the excitatory GABA theory has been questioned as potentially being an artefact of experimental conditions, with most data acquired in in-vitro brain slice experiments susceptible to un-physiological milieu such as deficient energy metabolism and neuronal damage. The controversy arose when a number of studies have shown that GABA in neonatal brain slices becomes inhibitory if glucose in perfusate is supplemented with ketone bodies, pyruvate, or lactate, or that the excitatory GABA was an artefact of neuronal damage. Subsequent studies from originators and proponents of the excitatory GABA theory have questioned these results, but the truth remained elusive until the real effects of GABA could be reliably elucidated in intact living brain. Since then, using technology such as in-vivo electrophysiology/imaging and optogenetics, two in-vivo studies have reported the effect of GABA on neonatal brain, and both have shown that GABA is indeed overall inhibitory, with its activation in the developing rodent brain not resulting in network activation, and instead leading to a decrease of activity. 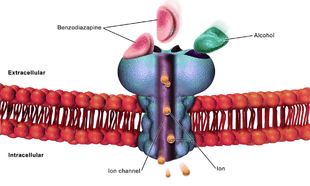 A subclass of ionotropic GABA receptors, insensitive to typical allosteric modulators of GABAA receptor channels such as benzodiazepines and barbiturates, was designated GABAС receptor. Native responses of the GABAC receptor type occur in retinal bipolar or horizontal cells across vertebrate species. GABAС receptors are exclusively composed of ρ (rho) subunits that are related to GABAA receptor subunits. Although the term "GABAС receptor" is frequently used, GABAС may be viewed as a variant within the GABAA receptor family. Others have argued that the differences between GABAС and GABAA receptors are large enough to justify maintaining the distinction between these two subclasses of GABA receptors. However, since GABAС receptors are closely related in sequence, structure, and function to GABAA receptors and since other GABAA receptors besides those containing ρ subunits appear to exhibit GABAС pharmacology, the Nomenclature Committee of the IUPHAR has recommended that the GABAС term no longer be used and these ρ receptors should be designated as the ρ subfamily of the GABAA receptors (GABAA-ρ). A slow response to GABA is mediated by GABAB receptors, originally defined on the basis of pharmacological properties. In studies focused on the control of neurotransmitter release, it was noted that a GABA receptor was responsible for modulating evoked release in a variety of isolated tissue preparations. This ability of GABA to inhibit neurotransmitter release from these preparations was not blocked by bicuculline, was not mimicked by isoguvacine, and was not dependent on Cl¯, all of which are characteristic of the GABAA receptor. The most striking discovery was the finding that baclofen (β-parachlorophenyl GABA), a clinically employed spasmolytic mimicked, in a stereoselective manner, the effect of GABA. Later ligand-binding studies provided direct evidence of binding sites for baclofen on central neuronal membranes. cDNA cloning confirmed that the GABAB receptor belongs to the family of G-protein coupled receptors. Additional information on GABAB receptors has been reviewed elsewhere. ↑ Farahmandfar, Maryam; Akbarabadi, Ardeshir; Bakhtazad, Atefeh; Zarrindast, Mohammad-Reza (2016-03-01). "Recovery from ketamine-induced amnesia by blockade of GABA-A receptor in medial prefrontal cortex of mice". Neuroscience. doi:10.1016/j.neuroscience.2016.02.056. ISSN 1873-7544. PMID 26944606. ↑ Kuffler SW, Edwards C (November 1958). "Mechanism of gamma aminobutyric acid (GABA) action and its relation to synaptic inhibition". J. Neurophysiol. 21 (6): 589–610. PMID 13599049. ↑ Kravitz EA, Kuffler SW, Potter DD (September 1963). "Gamma-aminobutyric acid and other blocking compounds in crustacea. III. Their relative concentrations in separated motor and inhibitory axons". J. Neurophysiol. 26: 739–51. PMID 14065325. ↑ Krnjević K, Schwartz S (1967). "The action of gamma-aminobutyric acid on cortical neurones". Exp Brain Res. 3 (4): 320–36. doi:10.1007/BF00237558. PMID 6031164. ↑ Takeuchi A, Takeuchi N (August 1967). "Anion permeability of the inhibitory post-synaptic membrane of the crayfish neuromuscular junction". J. Physiol. (Lond.). 191 (3): 575–90. doi:10.1113/jphysiol.1967.sp008269. PMC 1365493 . PMID 6051794. ↑ Takeuchi A, Takeuchi N (November 1969). "A study of the action of picrotoxin on the inhibitory neuromuscular junction of the crayfish". J. Physiol. (Lond.). 205 (2): 377–91. doi:10.1113/jphysiol.1969.sp008972. PMC 1348609 . PMID 5357245. ↑ Takeuchi A, Onodera K (March 1972). "Effect of bicuculline on the GABA receptor of the crayfish neuromuscular junction". Nature New Biol. 236 (63): 55–6. doi:10.1038/236055a0. PMID 4502428. 1 2 Barnard EA, Skolnick P, Olsen RW, Mohler H, Sieghart W, Biggio G, Braestrup C, Bateson AN, Langer SZ (June 1998). "International Union of Pharmacology. XV. Subtypes of gamma-aminobutyric acidA receptors: classification on the basis of subunit structure and receptor function". Pharmacol. Rev. 50 (2): 291–313. PMID 9647870. ↑ Hevers W, Lüddens H (August 1998). "The diversity of GABAA receptors. Pharmapoo and electrophysiological properties of GABAA channel subtypes". Mol. Neurobiol. 18 (1): 35–86. doi:10.1007/BF02741459. PMID 9824848. ↑ Sieghart W, Sperk G (August 2002). "Subunit composition, distribution and function of GABA(A) receptor subtypes". Curr Top Med Chem. 2 (8): 795–816. doi:10.2174/1568026023393507. PMID 12171572. ↑ Ben-Ari Y, Khazipov R, Leinekugel X, Caillard O, Gaiarsa JL (November 1997). "GABAA, NMDA and AMPA receptors: a developmentally regulated 'ménage à trois'". Trends Neurosci. 20 (11): 523–9. doi:10.1016/S0166-2236(97)01147-8. PMID 9364667. ↑ Taketo M, Yoshioka T (2000). "Developmental change of GABA(A) receptor-mediated current in rat hippocampus". Neuroscience. 96 (3): 507–14. doi:10.1016/S0306-4522(99)00574-6. PMID 10717431. ↑ Tomiko SA, Taraskevich PS, Douglas WW (February 1983). "GABA acts directly on cells of pituitary pars intermedia to alter hormone output". Nature. 301 (5902): 706–7. doi:10.1038/301706a0. PMID 6828152. ↑ Cherubini E, Gaiarsa JL, Ben-Ari Y (December 1991). "GABA: an excitatory transmitter in early postnatal life". Trends Neurosci. 14 (12): 515–9. doi:10.1016/0166-2236(91)90003-D. PMID 1726341. ↑ Lamsa K, Taira T (September 2003). "Use-dependent shift from inhibitory to excitatory GABAA receptor action in SP-O interneurons in the rat hippocampal CA3 area". J. Neurophysiol. 90 (3): 1983–95. doi:10.1152/jn.00060.2003. PMID 12750426. ↑ Rheims, Sylvain; Holmgren, Carl D.; Chazal, Genevieve; Mulder, Jan; Harkany, Tibor; Zilberter, Tanya; Zilberter, Yuri (August 2009). "GABA action in immature neocortical neurons directly depends on the availability of ketone bodies". Journal of Neurochemistry. 110 (4): 1330–1338. doi:10.1111/j.1471-4159.2009.06230.x. ↑ Holmgren, Carl D.; Mukhtarov, Marat; Malkov, Anton E.; Popova, Irina Y.; Bregestovski, Piotr; Zilberter, Yuri (February 2010). "Energy substrate availability as a determinant of neuronal resting potential, GABA signaling and spontaneous network activity in the neonatal cortex". Journal of Neurochemistry. 112 (4): 900–912. doi:10.1111/j.1471-4159.2009.06506.x. ↑ Dzhala, V.; Valeeva, G.; Glykys, J.; Khazipov, R.; Staley, K. (21 March 2012). "Traumatic Alterations in GABA Signaling Disrupt Hippocampal Network Activity in the Developing Brain". Journal of Neuroscience. 32 (12): 4017–4031. doi:10.1523/JNEUROSCI.5139-11.2012. ↑ Kirmse, K.; Witte, O. W.; Holthoff, K. (24 November 2010). "GABA Depolarizes Immature Neocortical Neurons in the Presence of the Ketone Body -Hydroxybutyrate". Journal of Neuroscience. 30 (47): 16002–16007. doi:10.1523/JNEUROSCI.2534-10.2010. ↑ Ruusuvuori, E.; Kirilkin, I.; Pandya, N.; Kaila, K. (17 November 2010). "Spontaneous Network Events Driven by Depolarizing GABA Action in Neonatal Hippocampal Slices are Not Attributable to Deficient Mitochondrial Energy Metabolism". Journal of Neuroscience. 30 (46): 15638–15642. doi:10.1523/JNEUROSCI.3355-10.2010. ↑ Tyzio, R.; Allene, C.; Nardou, R.; Picardo, M. A.; Yamamoto, S.; Sivakumaran, S.; Caiati, M. D.; Rheims, S.; Minlebaev, M.; Milh, M.; Ferre, P.; Khazipov, R.; Romette, J.-L.; Lorquin, J.; Cossart, R.; Khalilov, I.; Nehlig, A.; Cherubini, E.; Ben-Ari, Y. (5 January 2011). "Depolarizing Actions of GABA in Immature Neurons Depend Neither on Ketone Bodies Nor on Pyruvate". Journal of Neuroscience. 31 (1): 34–45. doi:10.1523/JNEUROSCI.3314-10.2011. ↑ Kirmse, Knut; Kummer, Michael; Kovalchuk, Yury; Witte, Otto W.; Garaschuk, Olga; Holthoff, Knut (16 July 2015). "GABA depolarizes immature neurons and inhibits network activity in the neonatal neocortex in vivo". Nature Communications. 6: 7750. doi:10.1038/ncomms8750. ↑ Valeeva, G.; Tressard, T.; Mukhtarov, M.; Baude, A.; Khazipov, R. (1 June 2016). "An Optogenetic Approach for Investigation of Excitatory and Inhibitory Network GABA Actions in Mice Expressing Channelrhodopsin-2 in GABAergic Neurons". Journal of Neuroscience. 36 (22): 5961–5973. doi:10.1523/JNEUROSCI.3482-15.2016. ↑ Zilberter, M. (5 October 2016). "Reality of Inhibitory GABA in Neonatal Brain: Time to Rewrite the Textbooks?". Journal of Neuroscience. 36 (40): 10242–10244. doi:10.1523/JNEUROSCI.2270-16.2016. ↑ Sivilotti L, Nistri A (1991). "GABA receptor mechanisms in the central nervous system". Prog. Neurobiol. 36 (1): 35–92. doi:10.1016/0301-0082(91)90036-Z. PMID 1847747. ↑ Bormann J, Feigenspan A (December 1995). "GABAC receptors". Trends Neurosci. 18 (12): 515–9. doi:10.1016/0166-2236(95)98370-E. PMID 8638289. ↑ Johnston GA (September 1996). "GABAc receptors: relatively simple transmitter -gated ion channels?". Trends Pharmacol. Sci. 17 (9): 319–23. doi:10.1016/0165-6147(96)10038-9. PMID 8885697. ↑ Drew CA, Johnston GA, Weatherby RP (December 1984). "Bicuculline-insensitive GABA receptors: studies on the binding of (-)-baclofen to rat cerebellar membranes". Neurosci. Lett. 52 (3): 317–21. doi:10.1016/0304-3940(84)90181-2. PMID 6097844. ↑ Zhang D, Pan ZH, Awobuluyi M, Lipton SA (March 2001). "Structure and function of GABA(C) receptors: a comparison of native versus recombinant receptors". Trends Pharmacol. Sci. 22 (3): 121–32. doi:10.1016/S0165-6147(00)01625-4. PMID 11239575. ↑ Feigenspan A, Wässle H, Bormann J (January 1993). "Pharmacology of GABA receptor Cl- channels in rat retinal bipolar cells". Nature. 361 (6408): 159–62. doi:10.1038/361159a0. PMID 7678450. ↑ Qian H, Dowling JE (January 1993). "Novel GABA responses from rod-driven retinal horizontal cells". Nature. 361 (6408): 162–4. doi:10.1038/361162a0. PMID 8421521. ↑ Lukasiewicz PD (June 1996). "GABAC receptors in the vertebrate retina". Mol. Neurobiol. 12 (3): 181–94. doi:10.1007/BF02755587. PMID 8884747. ↑ Wegelius K, Pasternack M, Hiltunen JO, Rivera C, Kaila K, Saarma M, Reeben M (January 1998). "Distribution of GABA receptor rho subunit transcripts in the rat brain". Eur. J. Neurosci. 10 (1): 350–7. doi:10.1046/j.1460-9568.1998.00023.x. PMID 9753143. ↑ Shimada S, Cutting G, Uhl GR (April 1992). "gamma-Aminobutyric acid A or C receptor? gamma-Aminobutyric acid rho 1 receptor RNA induces bicuculline-, barbiturate-, and benzodiazepine-insensitive gamma-aminobutyric acid responses in Xenopus oocytes". Mol. Pharmacol. 41 (4): 683–7. PMID 1314944. ↑ Kusama T, Spivak CE, Whiting P, Dawson VL, Schaeffer JC, Uhl GR (May 1993). "Pharmacology of GABA rho 1 and GABA alpha/beta receptors expressed in Xenopus oocytes and COS cells". Br. J. Pharmacol. 109 (1): 200–6. doi:10.1111/j.1476-5381.1993.tb13554.x. PMC 2175610 . PMID 8388298. ↑ Kusama T, Wang TL, Guggino WB, Cutting GR, Uhl GR (March 1993). "GABA rho 2 receptor pharmacological profile: GABA recognition site similarities to rho 1". Eur. J. Pharmacol. 245 (1): 83–4. doi:10.1016/0922-4106(93)90174-8. PMID 8386671. ↑ Chebib M, Johnston GA (April 2000). "GABA-Activated ligand gated ion channels: medicinal chemistry and molecular biology". J. Med. Chem. 43 (8): 1427–47. doi:10.1021/jm9904349. PMID 10780899. ↑ Bormann J (January 2000). "The 'ABC' of GABA receptors". Trends Pharmacol. Sci. 21 (1): 16–9. doi:10.1016/S0165-6147(99)01413-3. PMID 10637650. ↑ Olsen RW, Sieghart W (September 2008). "International Union of Pharmacology. LXX. Subtypes of γ-Aminobutyric AcidA Receptors: Classification on the Basis of Subunit Composition, Pharmacology, and Function. Update". Pharmacological Reviews. 60 (3): 243–60. doi:10.1124/pr.108.00505. PMC 2847512 . PMID 18790874. ↑ Bowery NG, Bettler B, Froestl W, Gallagher JP, Marshall F, Raiteri M, Bonner TI, Enna SJ (June 2002). "International Union of Pharmacology. XXXIII. Mammalian gamma-aminobutyric acid(B) receptors: structure and function". Pharmacological Reviews. 54 (2): 247–64. doi:10.1124/pr.54.2.247. PMID 12037141. ↑ Bowery NG, Hill DR, Hudson AL, Doble A, Middlemiss DN, Shaw J, Turnbull M (January 1980). "(-)Baclofen decreases neurotransmitter release in the mammalian CNS by an action at a novel GABA receptor". Nature. 283 (5742): 92–4. doi:10.1038/283092a0. PMID 6243177. ↑ Bein HJ (1972). "Pharmacological differentiations of muscle relaxants". In Birkmayer W. Spasticity: A Topical Survey. Hans Hubert Bern, Switzerland. pp. 76–89. ISBN 3-456-00390-0. ↑ Keberle H, Faigle JW (1972). "Synthesis and structure-activity relationship of the gamma-aminobutyric acid derivatives". In Birkmayer W. Spasticity: A Topical Survey. Hans Hubert Bern, Switzerland. pp. 76–89. ISBN 3-456-00390-0. ↑ Hill DR, Bowery NG (March 1981). "3H-baclofen and 3H-GABA bind to bicuculline-insensitive GABA B sites in rat brain". Nature. 290 (5802): 149–52. doi:10.1038/290149a0. PMID 6259535. ↑ Kaupmann K, Huggel K, Heid J, Flor PJ, Bischoff S, Mickel SJ, McMaster G, Angst C, Bittiger H, Froestl W, Bettler B (March 1997). "Expression cloning of GABA(B) receptors uncovers similarity to metabotropic glutamate receptors". Nature. 386 (6622): 239–46. doi:10.1038/386239a0. PMID 9069281. ↑ Enna SJ (October 1997). "GABAB receptor agonists and antagonists: pharmacological properties and therapeutic possibilities". Expert Opin Investig Drugs. 6 (10): 1319–25. doi:10.1517/13543784.6.10.1319. PMID 15989503. ↑ Bowery, N. G.; Enna, S. J. (1997). The GABA receptors. Totowa, NJ: Humana Press. ISBN 0-89603-458-5. ↑ Kaupmann K, Malitschek B, Schuler V, Heid J, Froestl W, Beck P, Mosbacher J, Bischoff S, Kulik A, Shigemoto R, Karschin A, Bettler B (December 1998). "GABA(B)-receptor subtypes assemble into functional heteromeric complexes". Nature. 396 (6712): 683–7. doi:10.1038/25360. PMID 9872317. ↑ Kaupmann K, Schuler V, Mosbacher J, Bischoff S, Bittiger H, Heid J, Froestl W, Leonhard S, Pfaff T, Karschin A, Bettler B (December 1998). "Human γ-aminobutyric acid type B receptors are differentially expressed and regulate inwardly rectifying K+ channels". Proc. Natl. Acad. Sci. U.S.A. 95 (25): 14991–6. doi:10.1073/pnas.95.25.14991. PMC 24563 . PMID 9844003. ↑ Marshall FH, Jones KA, Kaupmann K, Bettler B (October 1999). "GABA receptors - the first 7TM heterodimers". Trends Pharmacol. Sci. 20 (10): 396–9. doi:10.1016/S0165-6147(99)01383-8. PMID 10498952. ↑ Marshall FH, White J, Main M, Green A, Wise A (August 1999). "GABA(B) receptors function as heterodimers". Biochem. Soc. Trans. 27 (4): 530–5. PMID 10917635. ↑ Bowery NG, Enna SJ (January 2000). "gamma-aminobutyric acid(B) receptors: first of the functional metabotropic heterodimers". J. Pharmacol. Exp. Ther. 292 (1): 2–7. PMID 10604925. ↑ Enna SJ (2001). "GABAB receptor signaling pathways". In Möhler H. Pharmacology of GABA and Glycine Neurotransmission (Handbook of Experimental Pharmacology) (Volume 150). Berlin: Springer. pp. 329–342. ISBN 3-540-67616-3.